Copyright © 2018 by CPS. All rights reserved. Our school is located in the suburb of Claremont, on the outskirts of our beautiful city, Cape Town, at the very South of South Africa. As can be seen left (small), we have a stunning view of our mountains, just 5km away. On the map, at Location 1 (shown red), you can see that our school is on the corner of Palmyra and St Leger roads, with our main entrance in St Leger road. 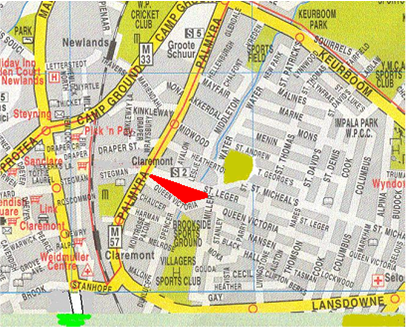 Our sports field is on the corner of Water and St Michael's roads, as shown at Location 2 (shown green).